I'm not always sure why we're going, when it comes down to it, and yet I so often end up in interesting places with my friend. Today: the University Combination Rooms, where either of us could have gone alone, but where we needed the moral support of one another actually to venture (and which you can see in this picture as the lighted window); then, the Tree Court at Caius, where I finally saw the sundial tower from its other side. 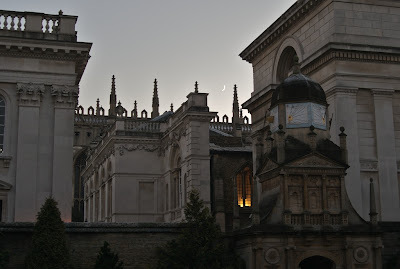 It is the top of the Gate of Honour at Gonville and Caius, where the the gates all have names. We passed through the Gate of Virtue on our way in, and through the Gate of Wisdom on our way out. I have been passing through these gates all my life. Tonight, a pantomime, and pizzas, and a highly attenuated pub crawl. The best part of the day, hands down, came when I looked over the Gate of Honour and saw the crescent moon rising, serene and admonitory. It knows so well; it is so much my reminder that these other excursions are beside the point, that the real thing, for me, is still coming into being. Now, I dream at two levels: grand, and grander.